Traveling by train across western Poland we saw a lot of small villages and farms that dot this mostly flat land. The closer we got to Warsaw, the more snow on the ground and more fog. The train station is in the center of the shopping district. Thank goodness the station porters handled all our large bags. We had to navigate through corridors and up an escalator and then stairs to street level. Across from the train station, shrouded in fog, was the Palace of Culture & Science, built by the Soviets. We stayed at the Victoria (Sofitel) Hotel. It was located only a few short blocks from "Old Town" and about a 20 minute walk from the downtown central shopping area. Across from the hotel was Sashi Park and the National Theatre (rebuilt and opened in 1965). At that time it had the biggest and most modern operatic stages in the world. 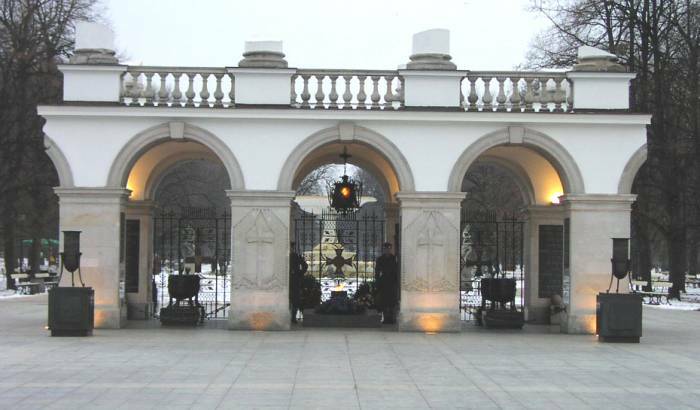 Also across the street from the hotel was the Tomb of the Unknown Soldier Memorial with an eternal flame. The changing of the guard was every hour. That afternoon we exchanged our Deutsche Marks for Polish Zloty (about 4 Zloty for 1 USD). We used American Express offices in each city to exchange traveler's checks for the local currency. It was easy to exchange one currency for another - but only bills, not coins. We walked to a local "shopping" street (Nowy Swiat) that had some very old churches, the Presidential Palace and Warsaw University. We walked into the Church of the Nuns of the Visitation where we witnessed a wedding, and Holy Cross Church. That evening we had a welcome dinner with all 30 members of the tour. The 13 new tour members flew from Frankfurt, arriving after a few hours delay due to the dense fog around Warsaw. The next day was a city tour conducted by Tadeusz Jedrysiak, the former president of the Polish tour guides. He formerly did German tours but learned English with the end of the Cold War in 1989. He mentioned under communist rule that education was free - now it's competitive but still free. Also jobs then were guaranteed, but now there is 18% unemployment. Health care is no longer free, it's part of their social security system. The Polish people are being told it takes one generation to recover and develop a free and open market system. Some of the history he mentioned: Poland, as a country, did not exist from 1795 until 1918. In 1795, the Kingdom of Poland was divided by Russia, Prussia, and the Austro-Hungarian Empire. After WWI, Poland was again a country. Their legislature is composed of 100 senators and 460 "deputies" - very similar to the US. 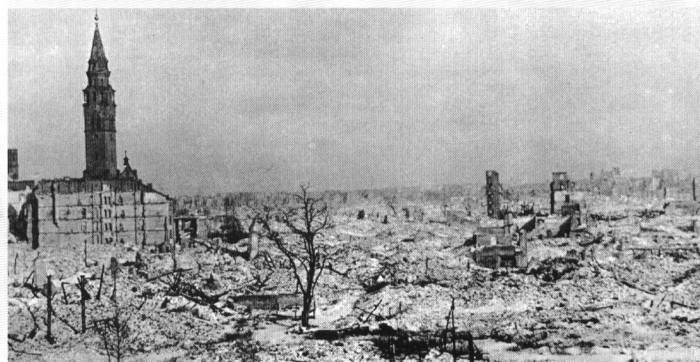 Warsaw suffered heavy damage during WWII. The rebuilt city now has wide streets and sidewalks. Visited the area of the Jewish Ghetto (95% destroyed in 1943 after the "Warsaw Ghetto Uprising"). In the heart of the ghetto is the Heroes of the Ghetto Memorial and the Holocaust Memorial which is a simple slab of granite. There was a Warsaw Uprising in 1944. 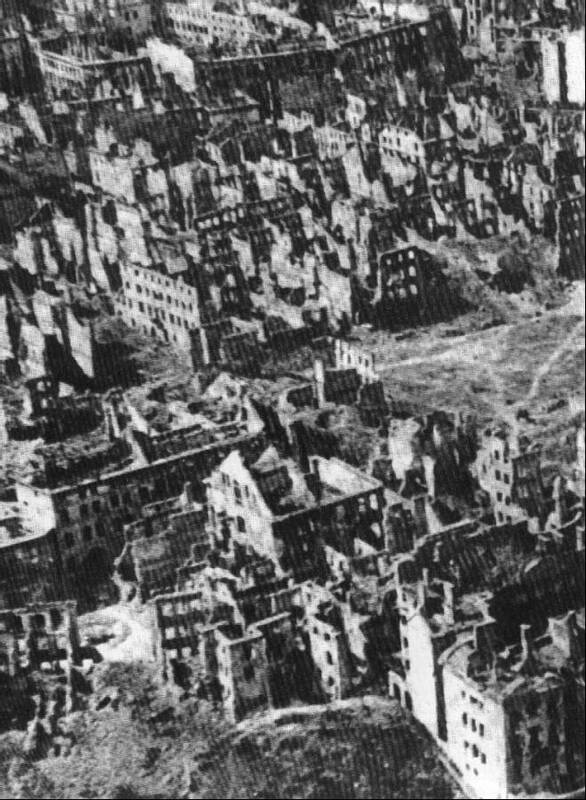 Much of the city was destroyed after this revolt under German rule. We were told 24% of the entire Polish population died in the war - 6 million in labor and concentration camps (1.3 million were Jewish). 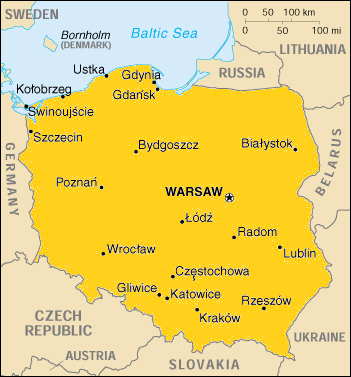 Currently the Warsaw population is 1.8 million and Poland is about 38 million. Warsaw University (founded in 1816) and a grand statue of Copernicus was close to the hotel. Also close by was the home of Fryderyk Chopin, the famous pianist. One of the first stops on the bus tour was the 18th century Lazienski Park (one of the largest city park's in Europe) with a huge statue of Chopin. Next to the park was the Bellevedre Presidential Palace (now used for visiting dignitaries). On the same boulevard was embassy row, with many magnificent buildings. The Old Town and Royal Castle were completely rebuilt using old pictures - very authentic looking. Some of the 14th and 15th century walls still remain. 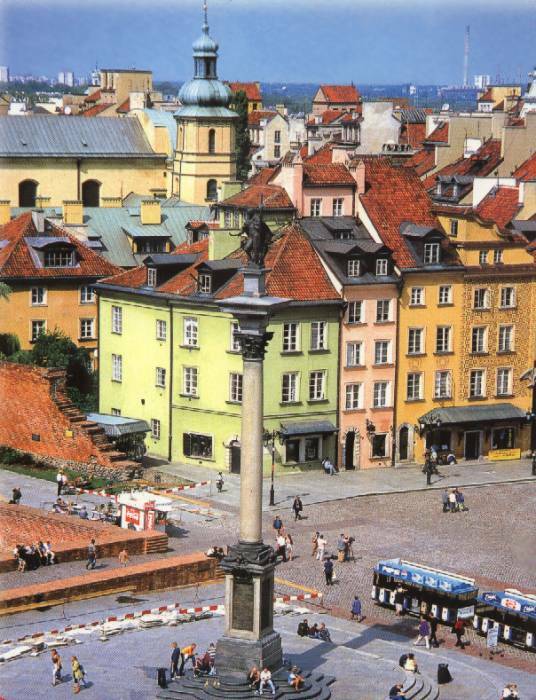 In Castle Square is the King Sigismund Column. 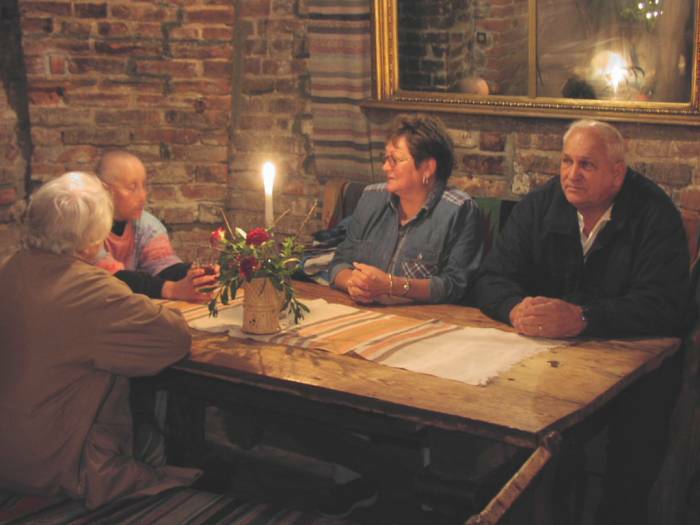 Having some free time in The Old Market Square, instead of shopping, we went to a nearby restaurant to get warm. We were directed to the basement which looked like an old cellar. The soups were delicious. After visiting the Old Town, we existed through the Barbican gate, one of the largest in Europe. 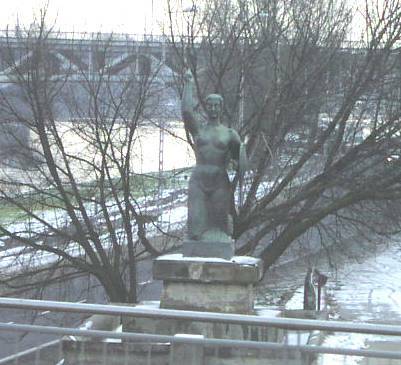 After crossing one of the bridges over the Vistula River we saw the Mermaid Monument. In the middle of one of the boulevards was the Eastern Front Memorial. That evening we again visited the nearby shopping street that was now closed to traffic. A stage was in place for a children's show and the arrival of St. Nicholas. It was fun listening to children singing Christmas songs in Polish. The next day (December 1) we visited Wilanow Palace - a grand residence that the Germans officers used during WWII. It is commonly called the Polish Versailles. It was built in the last quarter of the 17th century by King John III Sobieski, one of Poland's most famous kings. It is now a National Museum. As in other museums, we had our own English speaking guide. That evening we went to the suburbs to a home of a local family to have a traditional Polish meal of pierogi, potatoes, mushroom soup and wine. The hosts were both chemists, Peter (the son) just graduated from law school and is now taking courses in public administration (wants to be a judge or politician), and Joanne (the daughter) is studying sociology in an undergraduate program. Both spoke excellent English. Neither of our hosts did. Overall we had a great evening eating, drinking, discussing politics, education, jobs and unemployment, and life in Poland during and after the Cold War. Taxes are high - the VAT (Value Added Tax) is 22% plus a 7% national tax. We were told that both Germany and Poland are broke from rebuilding after the end of the Cold War.